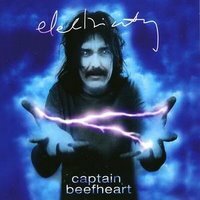 In a flurry of no publicity at all, Rhino Records have released their first scratchproof Captain Beefheart album. It is available only as a download. 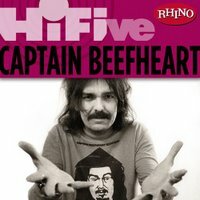 Rhino Hi-Five: Captain Beefheart & The Magic Band is a compilation of five tracks recorded between 1969 and 1978. It includes two live cuts and what Rhino describe as a remastered LP version of the song Bat Chain Puller. Bat Chain Puller was remastered to its sonic advantage for Virgin/EMI’s 2006 Captain Beefheart re-release CDs. The live tracks are from Rhino’s limited edition Beefheart CD, My Father’s Place. The other two tracks are taken from Trout Mask Replica and Shiny Beast (Bat Chain Puller). As all of these tracks are already issued on vinyl and/or CD, some may wonder whether the “lossy” WMA file format of Rhino’s album is the most suitable on which to listen to this material. This curiosity is available for money at Rhino’s Digital Store but in some territories it can be downloaded under license, without charge. Henry Kaiser is known here as a fine guitarist and composer who has often demonstrated a keen interest in the music of Captain Beefheart. He has recorded several cover versions of Don Van Vliet compositions, has researched Captain Beefheart recordings and other material in the Warner vaults, and has worked on various musical projects with John ‘Drumbo’ French. The 1987 album Crazy Backwards Alphabet, which Henry Kaiser recorded with John French, Michael Maksymenko and Andy West, among others, is a splendid realisation of post-Beefheart musical possibilities. 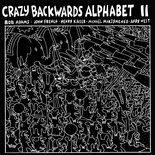 Crazy Backwards Alphabet II, consisting of previously unheard tracks taken from the original sessions, was released in September 2007 on Henry Kaiser’s new digital label There Records / A Train. A good many other Henry Kaiser albums have also been compressed for that label. There Records / A Train have kept very quiet about their “lossy” product, and there does not seem to be a vinyl or CD version of Crazy Backwards Alphabet II. As far as I know, just one track from Crazy Backwards Alphabet II is available in a non-scratchproof format. Ten Year Anniversary is on Michael Maksymenko’s 2008 retrospective CD from ReR Megacorp, Businesscide – MP3 and WMA samples at Juno Records. The Kräldjursanstalten MySpace page gives a taste of some of Michael’s other recordings. And while I’m mentioning Swedish musicians with a Beefheart bent, erstwhile Beefheart cover guitarist Jimmy Ågren has a new album called Various Phobias. His MySpace page should point the way. July’s Mojo magazine has a long article by Dave di Martino about the long and troubled relationship between Frank Zappa and Don Van Vliet. Drawing heavily on old music press stories, including his own 1993 interview with Bill Harkleroad, Martino supplements his research with fresh quotations from Pamela des Barres, Cal Schenkel and Gary Lucas. Gary’s story about the final meeting between Don and Frank is fleshed out in great detail, while Pamela des Barres and Cal Schenkel provide historical context. Several rarely seen photographs complete the piece. The cover of the June issue of Record Collector magazine suggests that it contains an piece about Captain Beefheart. Well ….. yes and no. The promised article turns out to be not much more than a review by Alan Clayson of a re-issue of the compilation CD, Electricity. Clayson roundly plugs fellow Record Collector contributor, Harry Shapiro, who, Clayson says, has written an “engrossing and informative essay” for the CD’s sleeve notes. An extremely short Q&A between Grahame Bent and John French completes the less than half page piece. The revisited Electricity compilation contains three ‘bonus’ tracks which were not included on the original: Safe As Milk (Take 5) , 25th Century Quaker, and Korn Ring Finger. There is an extract from Clayson’s review at Record Collector’s website. The death of graphic designer Alton Kelley has been announced. With collaborator Stanley Mouse, Kelley helped to define the face of west coast rock ‘n’ roll. Mouse and Kelley’s iconic images were used on hundreds of posters, albums, fliers and logos from the sixties onwards. 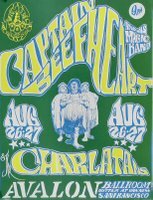 The Mouse and Kelley artwork pictured here advertises a Captain Beefheart two-night residence at San Francisco’s Avalon Ballroom in 1966. Hello to Manchester band Beep Seals, named after the Don Van Vliet poem and thanks to Trond Einar Garmo for mentioning the new Swedish CD releases to me. The Hi-Five collection of Beefheart has been out for some time now.